Welcome to the A.T. Still University family! It is an exciting time to be part of this dynamic, growing University, and I am pleased you have chosen to pursue your dreams with us. There is no place like ATSU. Students, faculty, staff, Board of Trustees, and communities work together to achieve outcomes only possible through extraordinary teamwork and alliances. At ATSU you will experience the benefits of rural and urban perspectives on healthcare, a commitment to whole person and whole community health, a family approach to nurturing student learning and personal growth, interprofessional experiences, and an inclusive and collaborative environment. May your time at ATSU be filled with professional success and a great sense of accomplishment as you learn to become tomorrow’s healers and healthcare leaders. P.S. Do you have an idea to make ATSU a better place to learn? Email your idea to ATSU Idea Box at ideas@atsu.edu, and I will personally respond. The effective date of the 2018-19 Catalog is June 1, 2018. View the 2018-19 University academic calendar. 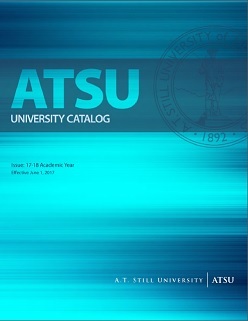 The 2018-19 ATSU University Catalog is available in PDF format for downloading or viewing. The A.T. Still University (ATSU) Catalog provides students with important information about policies, procedures, requirements, and services. Students are required to read, understand, and adhere to the provisions of the Catalog. An updated version of the Catalog is published each academic year. The yearly update (and any subsequent updates during the academic year) supersedes all prior editions and provides the latest rules, policies and procedures to create the most up-to-date student reference. The provisions of the Catalog do not constitute an irrevocable contract between ATSU and its students since plans, policies, requirements, and services may be altered from time to time. Therefore, ATSU reserves the right to amend modify, add, or delete information within the Catalog at any time without advance notice. Students are also required to thoroughly review the University Student Handbook for important additional policies, procedures, requirements, and services. For A.T. Still University’s policy prohibiting discrimination, harassment, and retaliation (ATSU Policy #90-210), please see: www.atsu.edu/prohibition-of-discrimination-harassment-and-retaliation. The policy in its entirety is located within the ATSU Policies section. The University complies with the Drug-Free Workplace Act of 1988 and the Drug-Free Schools and Communities Act Amendments of 1989. All publications © 2019 A.T. Still University. Powered by the Acalog™ Academic Catalog Management System™ (ACMS™).